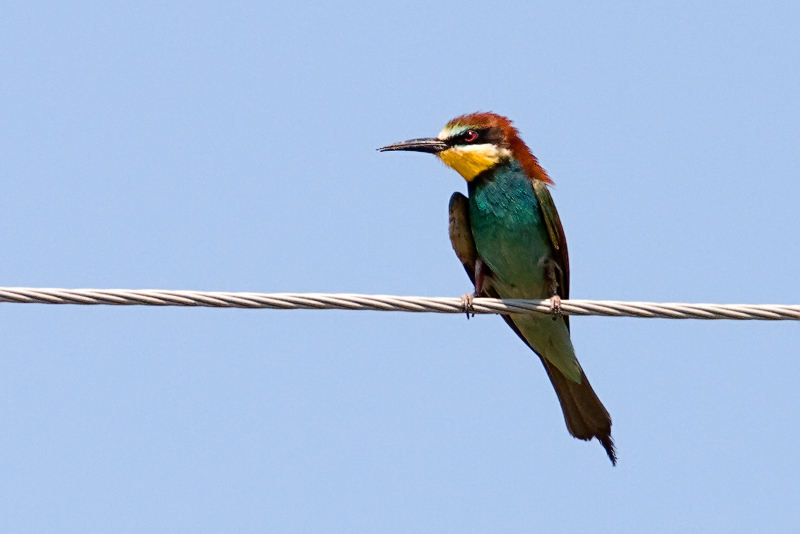 Every time when we go on trips to southern Europe we are looking for bee-eaters. A couple of years ago we had a beautiful close encounter but then we did not have any decent camera. But these last couple of years it has been with out any success. You have to be in the right spot at the right time of year. Now we read in a birdingbook (Gorman, Birding in eastern Europe) about lake Vrana on the mainland. Both bee-eaters and a observation tower draw our attention. We did not only spot the bee-eaters but lots of other spectacular bird like Pygme Cormorant, but we did not get any decent photos of them. This is from the area around lake Vrana about 30 km south of the town Zadar on the main land. We read about a bee-eater colony there and a birding tower and decided to do an excursion. As always, Canon 300/f4 lens and a 1,4 extender on a Canon 40D body. It is in rawformat and I used Adobe Lightroom for some adjustments before the edit in Photoshop CS3. The European Bee-eater, Merops apiaster, is a near passerine bird in the bee-eater family Meropidae. It breeds in southern Europe and in parts of north Africa and western Asia. It is strongly migratory, wintering in tropical Africa (or to North-Western India, southern India and Sri Lanka in the case of Asian birds). This species occurs as a spring overshoot north of its range, with occasional breeding in northwest Europe. This species, like other bee-eaters, is a richly-coloured, slender bird. It has brown and yellow upper parts, whilst the wings are green and the beak is black. It can reach a length of 27-29 cm, including the two elongated central tail feathers. Sexes are alike. This is a bird which breeds in open country in warmer climates. Just as the name suggests, bee-eaters predominantly eat insects, especially bees, wasps and hornets, which are caught in the air by sorties from an open perch. Before eating its meal, a European Bee-eater removes the sting by repeatedly hitting the insect on a hard surface. It eats some 250 bees daily. Very beautiful photo in excellent clear colours. Sharpness and details are fantastic. Nice pose and POV. Good composition and OOF BG. Good shot of the bee eater, everyoones favourite, a beautiful species. We certainly look for the European Bee-eater in Sweden and that is not easy! Nice capture in a typical pose on a wire with good sharpness and lighting. I hope to see it in Sweden one day. I would LOVE to see a Bee-eater for real. This one is a beauty. The pose on the wire is terrific showing off his wonderful profile. Excellent colors and nice sharp details of his face, eye, and plummage.